This vintage home has great bones; but its floor plan was limited to a 1930’s lifestyle, when a three bedroom and one bath layout was ideal. The owners wanted to update the floor plan and bring their home into the 21st century. Expanding on the wish list, see below for details. Expanded footprint to maximum allowable side yard zoning restrictions. Installed custom painted wood cabinetry with wood stained countertop. We wanted to keep the windows at a constant height, but we needed some flexibility for desk placement. 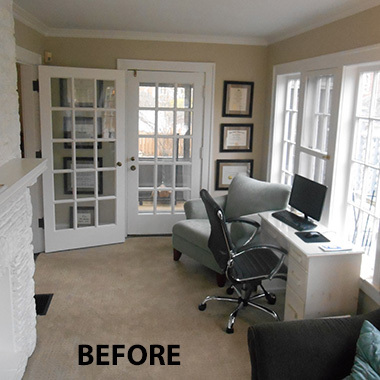 The solution came when positioning the cabinetry unit and countertop at a distance that allowed for a window cavity behind the desk. We needed to integrate a mechanical chase behind an interior swinging entry door. To create balance and symmetry, we designed and installed a built-in bookcase system opposite the chase, with the same dimensions. Mission-style doors and end panel mimic turn of the century design styles. 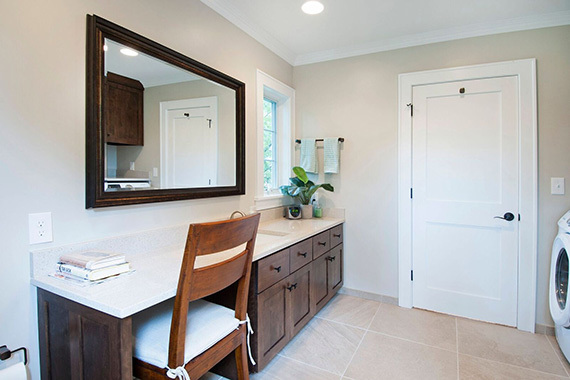 Traditional stain finishes serve as subtle contrast to the other clean, monotone finishes. 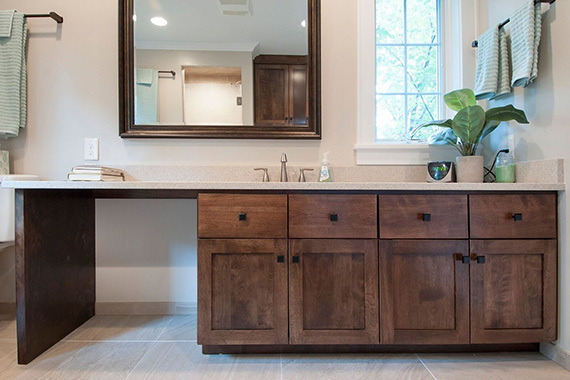 Both the vanity and the laundry cabinetry are designed alike, unifying the space. This simple, relatively average-sized shower is creatively finished with all neutral tile; however, the different surfaces are treated separately to add depth, variation and character. A tempered, rain-textured shower door creates privacy while letting in natural light. As a bonus, this material shows minimal water streaking. We moved the laundry area up from the basement for added convenience. Wall cabinets maximize the storage area and can accommodate bulky laundry detergent containers. Located right off the bedroom, this area is easily accessible. Two full walls of adjustable wire shelving provide stacking and hanging capabilities. 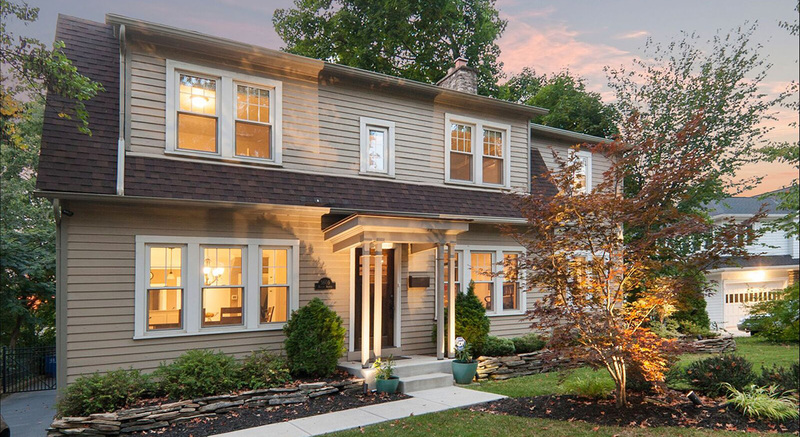 A window balances the exterior design and provides natural light. 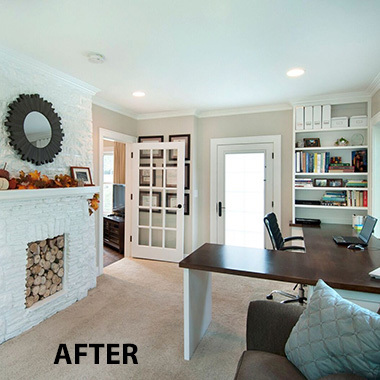 Trim finishes and design details mimic the home’s original style. New modern elements were added with traditional elegance in mind. New design retains the home’s exterior balance for continuity. We added a retaining wall at the side walk and drive. After back-filling the retaining wall area the front yard is level and more usable. We removed and replaced the side walk area. Looking to renovate your home? Call NJW Construction today to get started with your free consultation!